Longtin Agency won the March Charity Give-A-Way from Express Employment Professionals. 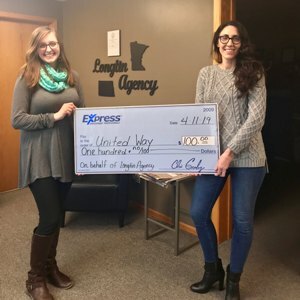 Longtin Agency was awarded $100 to any charity of their choice and they donated to the United Way of Crookston for all the great things they do throughout the year. Longtin also receives an office luncheon at a local eatery up to $100 from Express Employment Professionals.